Heavy and well built ship suitable for sailing around the world. The bottom is 14 mm thick. The ship has been prepared by the current owner from 2013 until 2018 for a big voyage. The ship is in very good condition. A lot has been renewed. A comprehensive list of activities is available on request. The ship is now sailing in the Caribbean Sea and is on its way. The ship can be delivered in consultation in the Caribbean, USA or Europe. 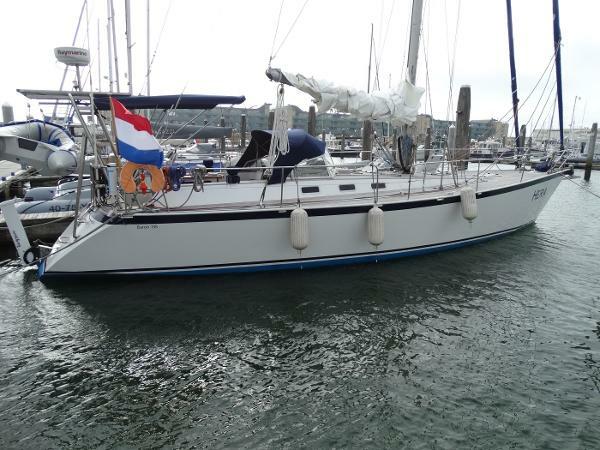 Are you looking for an excellent ship for a large voyage? 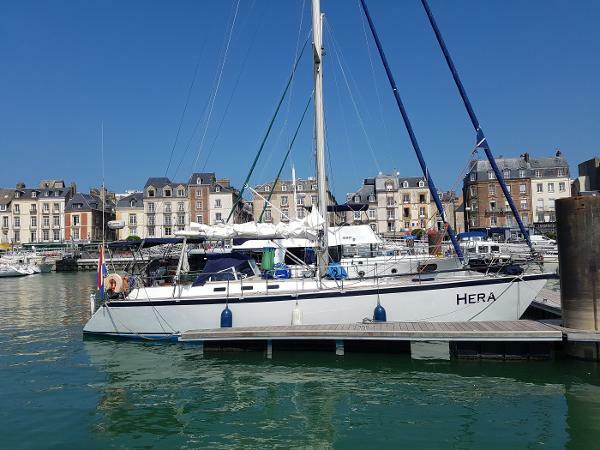 Come and see this Hera for sure.General: Name ship Hera, brand and type of ship Baron 135, length 13.70 m, width 4.05 m, draught 2.10 m, year of construction 1992, building number 5302, builder Baron Yachtbau, designer Dieter Hagenah, multi chine hull, fin keel, steel, teak deck, waterdisplacement 19.000 kg, ballast 7.000 kg, steering wheel steering, Rocna 33 kg anchor with electric windlass, 2nd CQR anchor 35 LBS, integrated bathing platform, stainless steel bathing ladder, lifebuoy, bilge pump (manual and electric), perspex windows, interior panelling teak, 7 berths, 3 cabins, headroom salon 2.00 m, bed length for 2.00 m, bed length salon bench 2.00 m, bed length aft cabins 2.00 m.Engine:Engine type Sole Mini 62, 62 hp, construction number 4869, year of manufacture 2001, overhauled in 2017, diesel, consumption approx. 3 litre/hour, propeller shaft with homokinetic PythonDrive, indirect cooling, 3 blade fixed propeller, stainless steel fuel tank 200 litres, rev counter, hour counter approx. 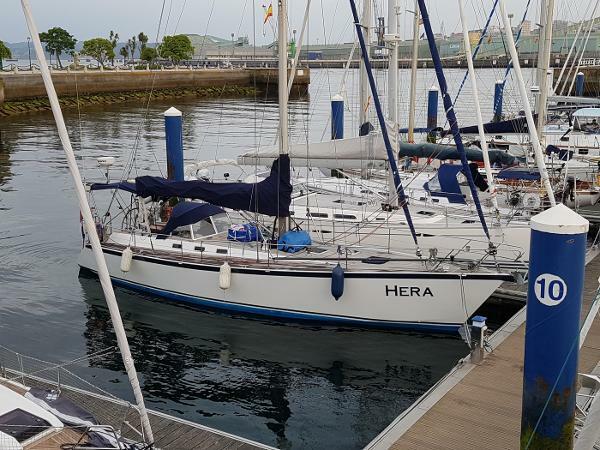 1,200 hours after overhaul, signal for oil pressure and temperature, fuel level meter, bow thrusterRigging:Bridge clearance 21.00 m, cutter rigged, mainsail 39 m2 from 2016 with double binding reef, genoa 60 m2 on furling installation, cutter jib on hanks 28 m2, storm jib orange colored, gennaker 133 m2, stainless steel rigging replaced 2013, sprayhood replaced 2018, bimini, 6 winches.Navigation and equipment:Light battery 2 times 230 Ah Victron super Cycle 2018, starter battery Northstar 90 Ah, 12 Volt system, shore power connection with earth leakage switch, Mastervolt battery charger 70 Ah, inverter 2000 Watt, Watt&Sea Hydrogenerator, 300 watt Mastervolt solar panels, Ralo compass in steering position, Raymarine ST60 tridata depth and log, Raymarine ST60 windset, Raymarine E7 hybrid Touch chartplotter, MLR FX-312 GPS, Standard Horizon GX2000 VHF with DSC, 2nd VHF Sailor RT2047, Em-Trak b100 Class B AIS transponder, Raymarine 2KW radar, Icom IC-M700D radio SSB, Renaud Navtex, Raymarine autopilot EV-400 connected below deck, navigation lights (top light LED lopolight). Gas and water:Stainless steel water tank 500 liters, electric water pressure system, boiler (220V + engine), outdoor shower with hot and cold water, Jabsco underwater toilet manually operated, refrigerator, 3-burner stove (gas), oven, gas bun, Dickinson diesel heating. Safety and extra: Epirb, AIS personal beacon, multiple fire extinguishers, Seago liferaft 6 persons, safety lines over deck, Joon, Seago rescue lifesling, sea anchor, 3 complete dive sets with 4 bottles, Lodestar 260 airdeck dinghy, Suzuki 5 hp outboard engine Disclaimer:Information is provided to the best of our knowledge and belief, however yachtbrokerage eSailing is not liable for the quality and/or description of the vessel.